I have been in South Africa for almost six years now. And, where I come from, as you saw in my previous post, I am used to very cold and snowy Christmas’s. So, it has been such a nice change to have Christmas ushered in by summer. This year, summer started 21 December at 23:03 to be exact. Summer is such an awesome Christmas present. and what better way to celebrate such a gift with a colorful, healthy and tasty non meat dish. This Prawn Ceviche is so fresh and delicious, you’ll want to make a batch and nosh on it all weekend. 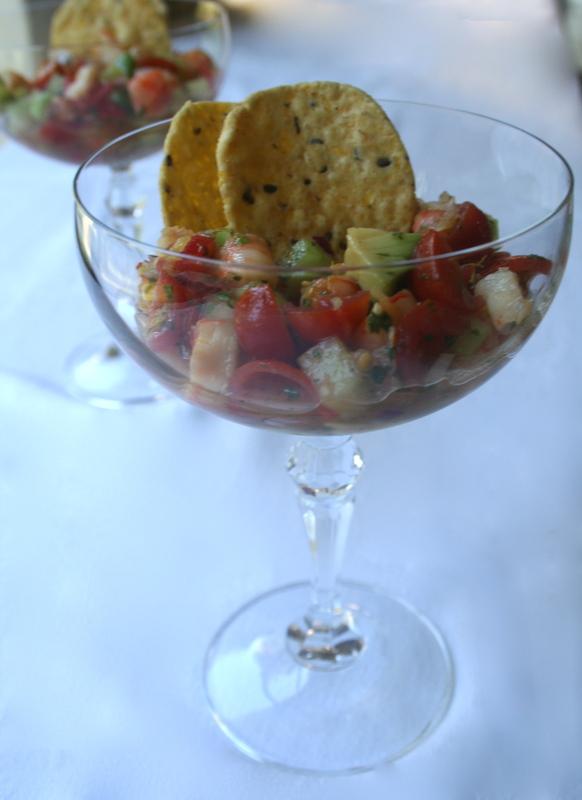 What to serve your Prawn Ceviche atop? You can serve it on a bed of greens or a tortilla. 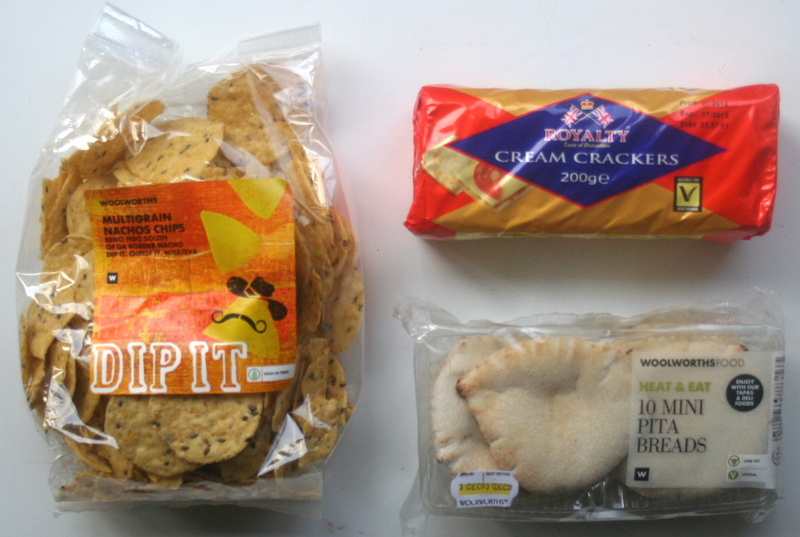 You can also serve it with corn chips, biscuits or even with mini pitas, whatever you like really. It figures, I like corn chips. Aren’t these just the prettiest prawns (shrimp) ever? In the States, prawns are an icky gray color until they are cooked. Then they turn the pretty coral color. Well, drop these in a pot of salted boiling water. When the water starts to reboil its probably time for them to come out. They should cook about 5 minutes max. Cool them off under cold water and chop them into small centimeter (1/2 inch) pieces. Stick in fridge. I am a zester. When a recipe calls for fresh citrus, I will typically zest the fruit and add it to what I am cooking. It only takes a few minutes and it punches up the flavor so much. After you zest, pop each piece of fruit in the micro for a 30 – 60 seconds. This will make juicing a lot easier. Be sure to let fruit cool a bit before cutting. Otherwise, it may spatter scalding hot juice. Fresh limes aren’t always available and when they are, they are sometimes uber expensive — like R49 ($6) for about 5 teeny tiny limes. So, here are two fresh lime juice alternatives. 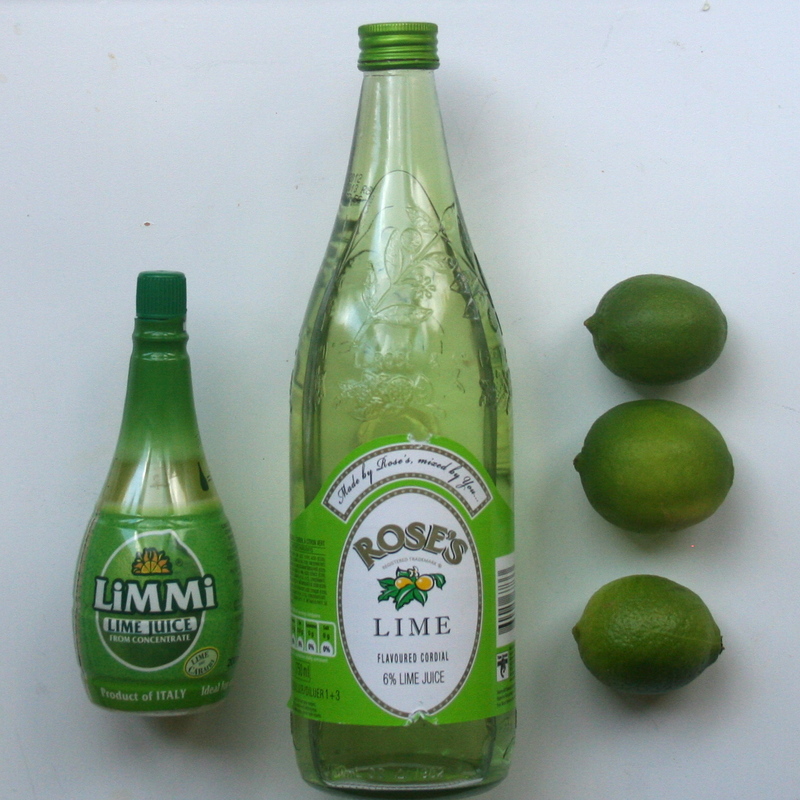 Limmi, which I found at Pic N Pay is imported from Italy and is lime juice from concentrate. It’s doesn’t taste like real lime juice, but it will do for salsas and such. I wouldn’t use it for a key lime pie though. The Rose’s Lime is a Cordial, which again, really doesn’t taste like lime juice and is loaded with sugar and only 6% lime juice, but it’s good for adding to cocktails. My husband adds it to most cocktails I make. I think he may think I am bit heavy-handed on the spirits. Ceviche is served cold. So, as you chop your veg, pop them in the fridge to get the chill going. Now its time to start chopping. You want to chop in a one centimeter (1/3 inch) or a little smaller dice. I’ll show you with the cucumber. 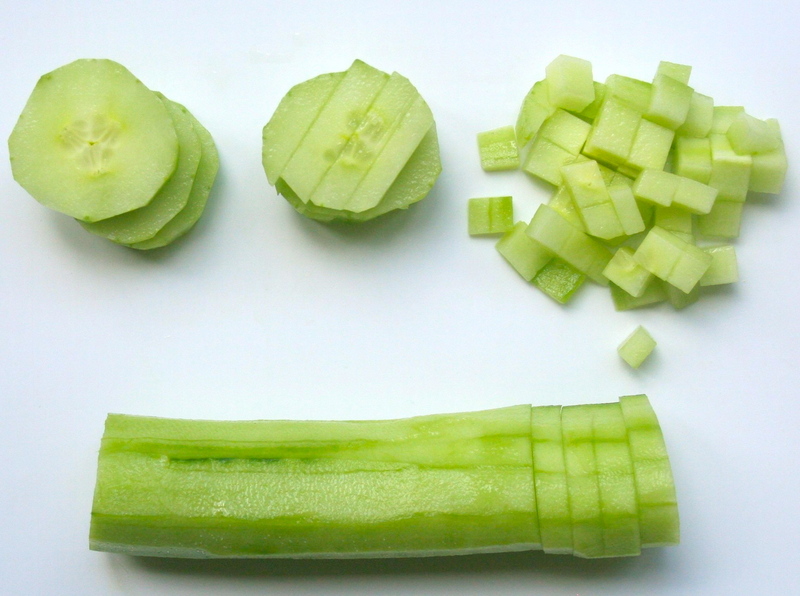 Just cut in slices then cut the slices in vertical quarters unless it is an especially skinny cuc then cut it into thirds. Then make the same cuts horizontally. That’s it. Then cut the tomato the same size. The onion I would cut a bit smaller. The avo you will want to chop just before serving, cutting into the same centimeter size dice. 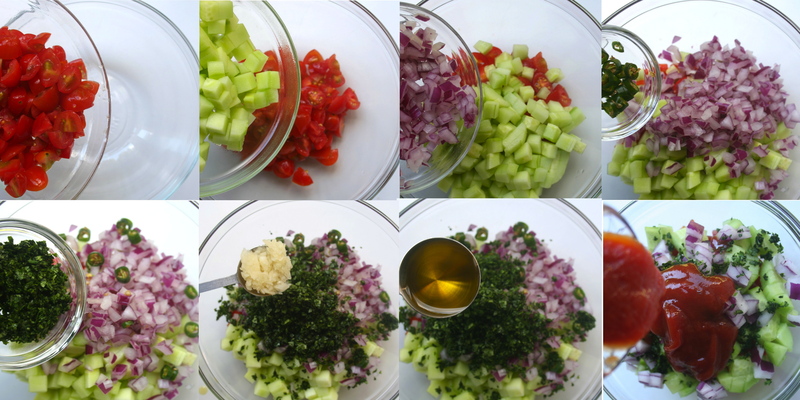 Ok, now to a bowl add all the chopped veg, minced spices, the olive oil and ketchup. Ok, normally, I don’t like to add a prepared food item, such as ketchup to something I am making. I like to use fresh ingredients. However, in this case (and one other – pepper steak) I think the ketchup is a necessary evil. It just adds a certain balance and zing that I have not been able to replicate without the red stuff. 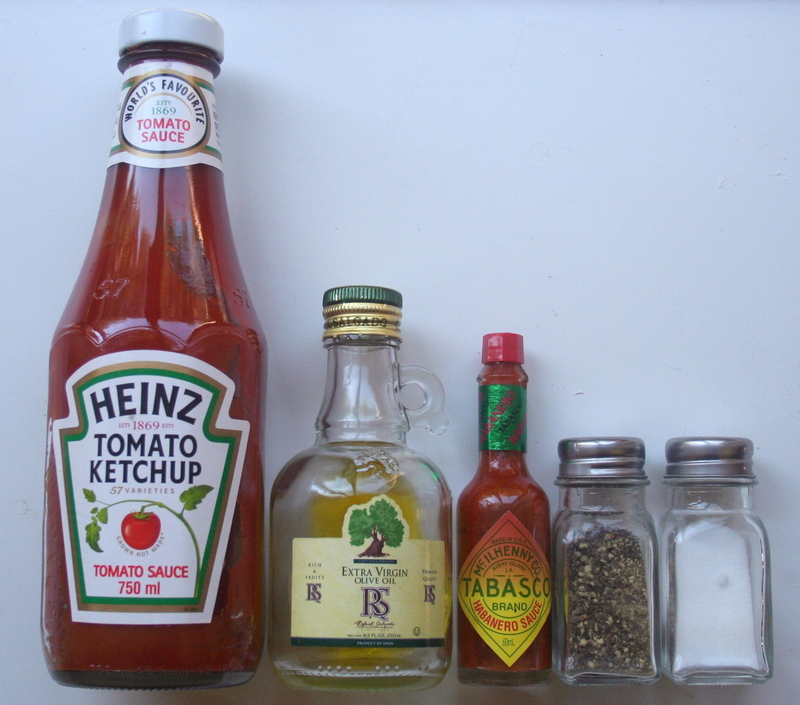 One day I will figure out how to make my own ketchup. 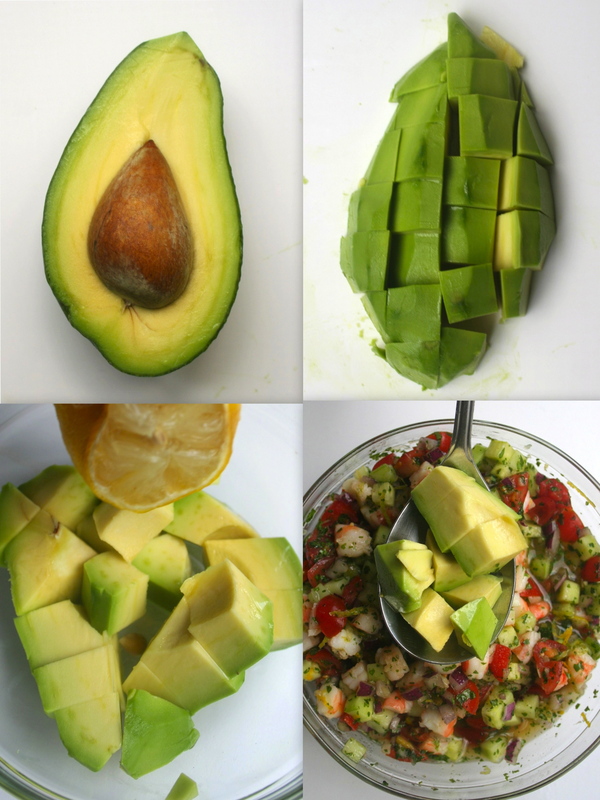 Oh, and you’ll want to chop and add the avo just before serving. 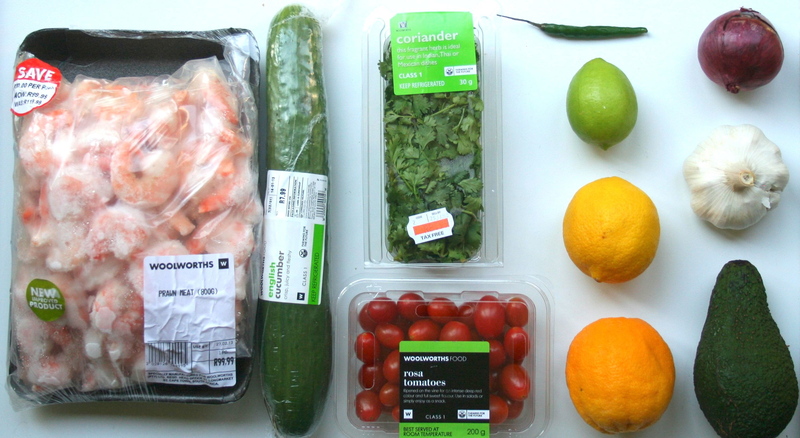 Mix well and put in the fridge with the prawns to chill for several hours. Now that you have tasted it, you can add salt. If your prawns were brined, you may need little to no salt. And, don’t forget a little hot sauce!! When you are just about ready to serve, you can chop your avo. If you really have to chop it in advance, squeeze lemon juice on it to retard browning. By the way, notice any thing off about the avo? Well, I didn’t follow the instructions. These pieces are waaayyy too big. I ended up fishing the large hunks of avo out and cutting them down to size for the final close up. Add chips and serve. Have a bowl of extra chips handy also. To serve — Tortilla (corn) chips, mini pitas or savory biscuits (crackers) to serve. Or you can serve on a bed of greens as a salad. 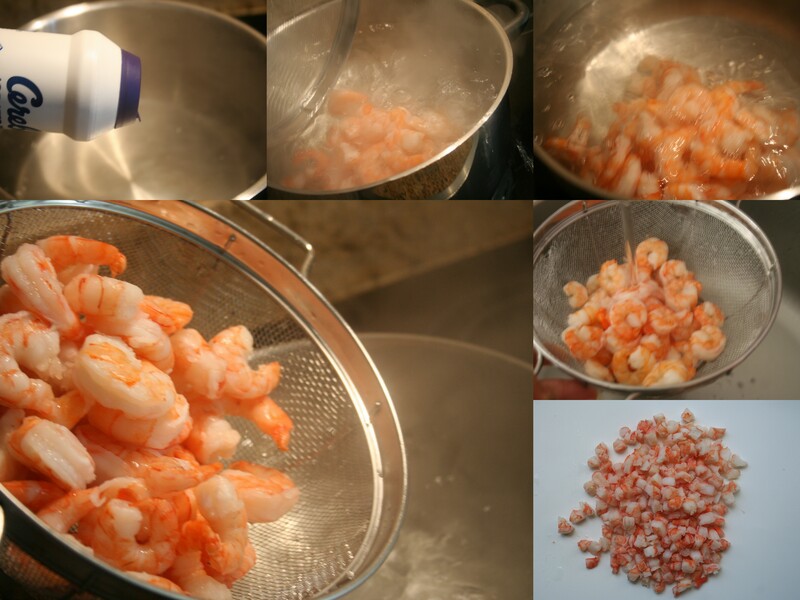 Drop peeled, deveined prawns in a pot of salted boiling water. When the water starts to re boil its probably time for them to come out. They should cook about 3 – 5 minutes max. Cool off under cold running water. Then chop them into small, one-centimeter (1/3 inch) pieces. Stick in fridge. Zest about a teaspoon of the peel from a lime, lemon and orange. Set Aside. Toss the lime, lemon and orange into the microwave for about 30 – 45 seconds each. Makes juicing easier. Be sure to let fruit cool a bit before cutting. Otherwise, it may spatter scalding hot juice. Juice fruit. 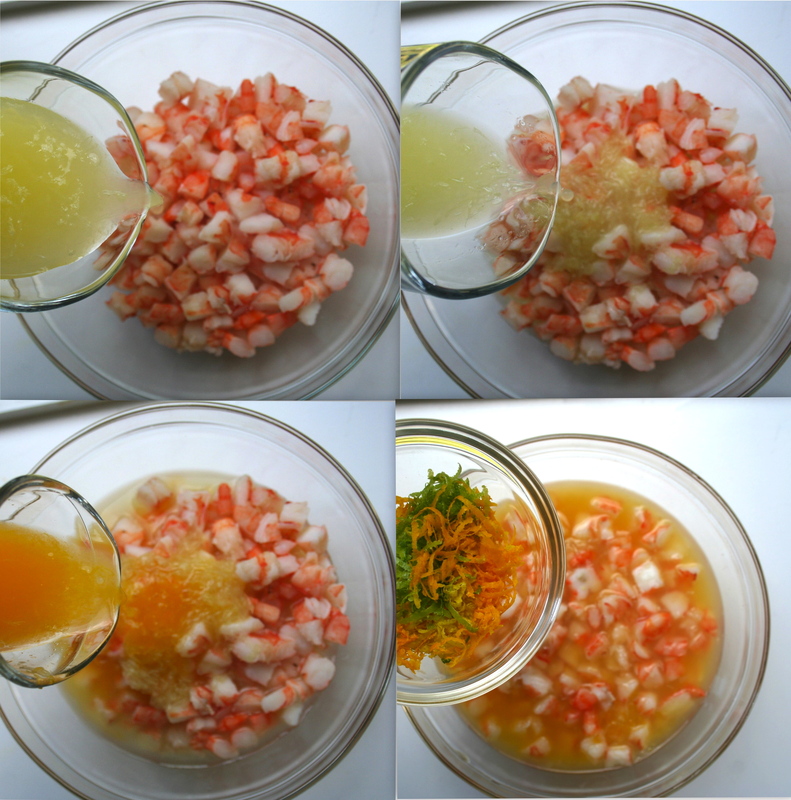 Add lime juice, lemon juice, orange juice and zests to the chopped prawns . Stick back in fridge for a several hours up to 24 hours. But, push bowl way in the back where it is nice and cold. You can prepare the shrimp the day before, but chop and add the vegetables the day you plan to serve. You don’t want the vegetables to get mushy. While the prawns are chilling, start chopping the vegetables (except the avocado – you’ll chop and add the avo just before serving). 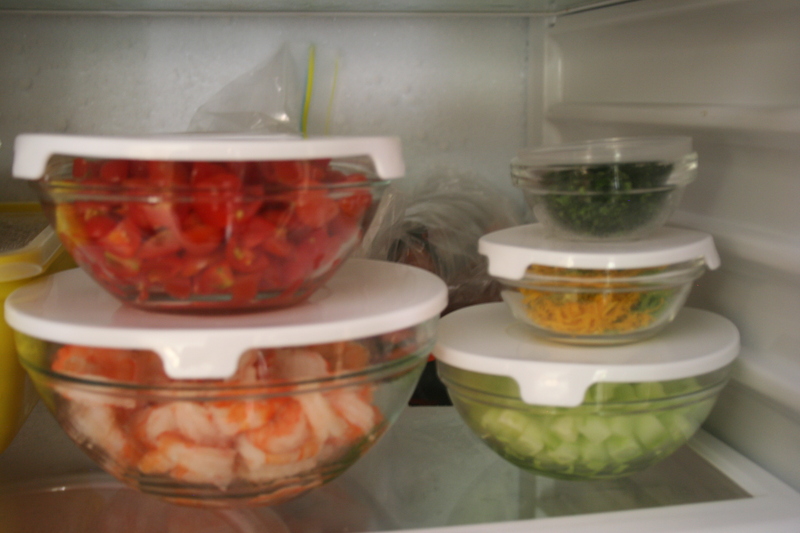 To get a head start on chilling, pop the vegetables in the fridge as you chop. 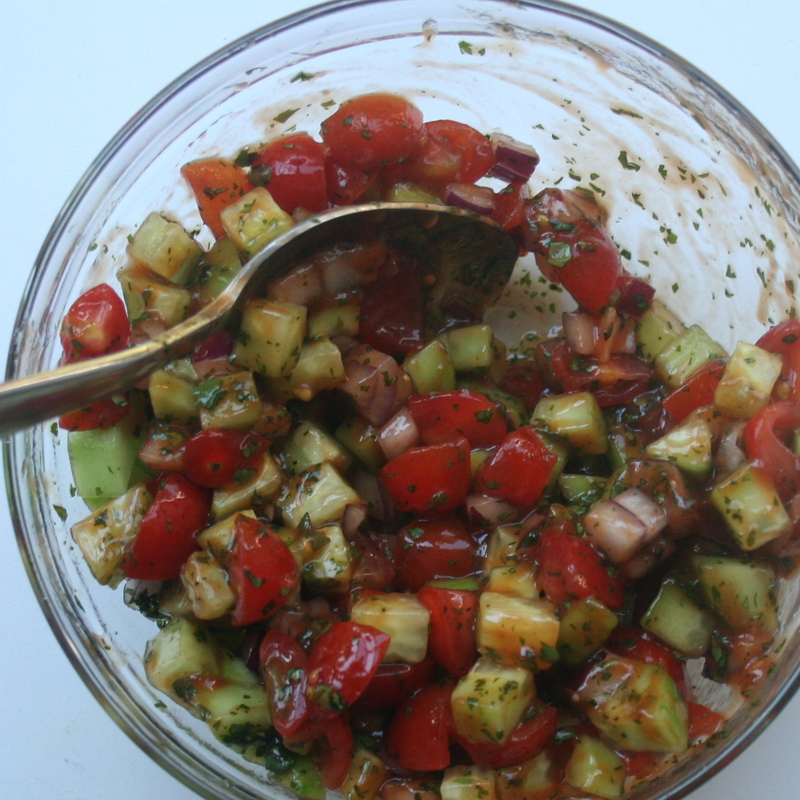 To the chopped prawns, add tomatoes, cucumbers, red onion, chili, coriander (cilantro), garlic, olive oil, and tomato sauce (ketchup) and return to fridge until ready to serve. Just before serving, peel and chop the avo and toss with lemon juice before adding to prawn mixture. Now taste. Add salt, black pepper and hot sauce to taste. Serve with tortilla (corn) chips, mini pitas or savory biscuits (crackers). Or you can serve on a bed of greens as a salad.